Students who are not United States citizens and are living outside the United States must apply for an F-1 Visa (student visa) at the American embassy in their home country. Students applying for an F-1 Visa must take a signed copy of their I-20 to the embassy. 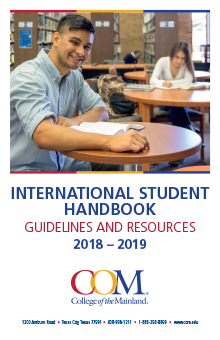 The I-20 will be sent to student's home country only after all of the required documents have been completed and submitted to College of the Mainland. Please file the required documents at least six weeks prior to the deadline listed below in which you intend to begin your studies. A student will not be considered for admissions until all required credentials have been received. All documents submitted must be originals or notarized/certified copies. Documents submitted after the deadline will not be accepted. The application must be completed online at www.applytexas.org. Students applying to College of the Mainland must have completed high school in their home country (U.S. equivalent of 12 years of education) before applying for admission. Students must submit all the official transcript(s) (or notarized copies) from all U.S. and foreign educational institutions attended at the high school and/or university/college level. COM also requires proof that you have had these transcripts evaluated by an accepted evaluation company from the list provided; COM will not accept transcripts that have not been evaluated. COM requires all international students to submit an English language proficiency test score. or a letter from a U.S. employer stating annual income may also be accepted (sponsor). The above International Student Application Form (I-20) must be completed and submitted. This application is to provide the student with an I-20 which will be needed when applying for an F-1 Visa at the U.S. embassy. An I-20 form will be prepared by the Office of Admissions and Records only when all of the above documentation is submitted and on file. For more information, read SEVIS Fee Instructions. If you want to get your documents faster, you can use COM’s express shipping via FedEx, DHL or UPS but there is an extra expense for students. Initial I-20 requests: Wait until we send you an email letting you know your document has been issued before you request an eShip delivery. To request express mail service, go to eShip. The site works best with Internet Explorer or Mozilla Firefox browsers. Do not go to the DHL, FedEx or UPS sites directly. When you have completed the request, eShip will send you an email that includes a tracking number and order details for your shipment. If you experience any problems when using the online service, please use the help feature on their website.